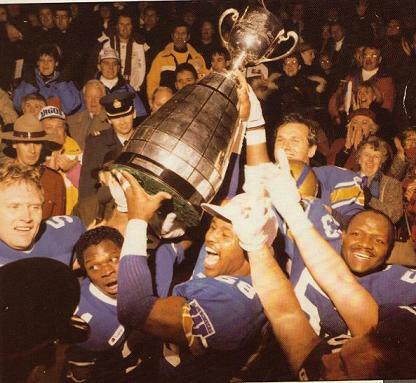 The 1990 Bombers were hardly an offensive juggernaut, finishing with a league-low 472 points.But they did have some offensive stars and, coupled with an absolutely stifling defence, cranked out 12 wins during the regular season en route to the 10thGrey Cup title in franchise history. The 1990 season began with most experts predicting the Bombers would finish last in the East Division, especially after a 1989 campaign that saw the club finish 7-11 following seven-consecutive defeats before a loss in the East Final. As the new season neared, and with Lee Saltz and Sam Garza listed 1-2 on the Bombers quarterback depth chart, GM Cal Murphy pulled off a shrewd deal that would be critical in the team’s success. Just prior to the start of the season, on Canada Day to be exact, Murphy swung a trade with the Saskatchewan Roughriders to land veteran pivot Tom Burgess. He was gritty, intelligent and gave the Bombers exactly the kind of efficient quarterbacking they needed – including a critical 30-yard run in the dying moments of the 1990 East Final that set up Trevor Kennerd’s game-winning field goal over the Toronto Argonauts. Burgess came up big again in the championship, as he was named the Grey Cup offensive MVP after completing 18 of 31 passes for 286 yards with three touchdowns to Lee Hull, Perry Tuttle and Warren Hudson. Danny McManus came off the bench later in the game and connected with Rick House for the other offensive TD. But, as was the case all season, it was the defence that was the backbone in the championship win. Linebacker Greg Battle, the CFL’s Most Outstanding Defensive Player in 1990, intercepted two passes in the Grey Cup – returning one 32 yards for a TD – and was named the game’s defensive MVP with James West and Tyrone Jones registering sacks. 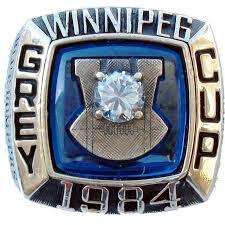 The 1988 Winnipeg Blue Bombers season opened with the finish of the 1987 campaign still stinging. There was a ton of change heading into 1988, as well. Gone were quarterback Tom Clements, the CFL’s Most Outstanding Player in 1987 who had retired, along with Willard Reaves and Tyrone Jones to the NFL while the league’s top Canadian, Scott Flagel signed with Calgary. They were 9-6 in October, but dropped their last three games to finish 9-9. That meant that as the playoffs opened, the Bombers were the longest of long shots. Just 12,210 fans showed up to watch the club knock off Hamilton at home in the East Semi-Final. But momentum or, at least, hope, began to build after the Bombers knocked off the heavily-favoured Argos – 14-4 that season – in the East Final, leading to a Grey-Cup matchup against the 10-8 B.C. Lions. The first-ever Grey Cup played in the nation’s capital was impacted by the weather. Conditions at kickoff were listed as 14C, but with winds gusting at 40 km/h. That made the kicking game critical, and punter Bob Cameron – the best wind-kicker in CFL history – played a mammoth role. Named the top Canadian, Cameron kicked two singles, but handled the wind conditions perfectly in a game that was all about field position. Bombers QB Sean Salisbury connected with James Murphy for the team’s only touchdown, Trevor Kennerd hit four field goals and the win was sealed by one of the most-memorable moments in club history. Lions star pivot Matt Dunigan had driven his club to the Bombers seven-yard line with 1:45 left in the game when Delbert Fowler tipped a pass attempt into the end zone that was then grabbed by Michael Gray. It was a play dubbed ‘The Immaculate Interception’ and it was massive in the club’s 9thGrey Cup title. Blue Bombers (22) – TDs: James Murphy; FGs: Trevor Kennerd (4); Convert: Kennerd (1); Single: Bob Cameron (2); Kennerd. The Blue Bombers lived the life of rock stars after capturing the 1984 Grey Cup, as it had been 22 years since their 1962 victory and 19 years since the team’s last appearance in the championship. And so, when the team returned home from the first-ever Grey Cup played in Edmonton, they were greeted like conquering heroes. That wasn’t surprising. Not only had the Bombers not appeared in the title game since 1965, some solid clubs under head coach Ray Jauch and led by Dieter Brock in the late 1970s/early 1980s had unfortunately worked in the shadow of the CFL’s greatest dynasty in the Edmonton Eskimos of 1978-82. The Bombers were led by former B.C. 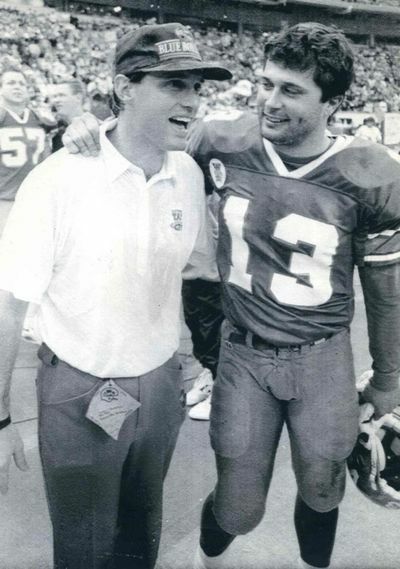 Lions head coach and Eskimo and Montreal Alouettes assistant Cal Murphy, then just in his second season as the team’s head coach, and finished 1984 with a 11-4-1 record. After knocking off the Esks in theWest Semi-Final, they upset the B.C. Lions at a sold-out B.C. Place to win the division. Winnipeg faced the Ticats in the title game and lined up against a familiar face – Brock, who had demanded and been granted a trade a year earlier in a deal that landed the Bombers quarterback Tom Clements. It was Brock who snuck in for the game’s first score and the Ticats roared out to a 17-3 advantage before the Bombers found their footing on the icy grass at Commonwealth Stadium. Winnipeg set a record for points in a quarter with 27 (later broken by the Bombers in the 1990 Grey Cup, with 28) in what became a thorough spanking of the Ticats. Clements was named the offensive MVP, running back Sean Kehoe was the top Canadian while Tyrone Jones, who set a record with four quarterback sacks, was the top defensive player. 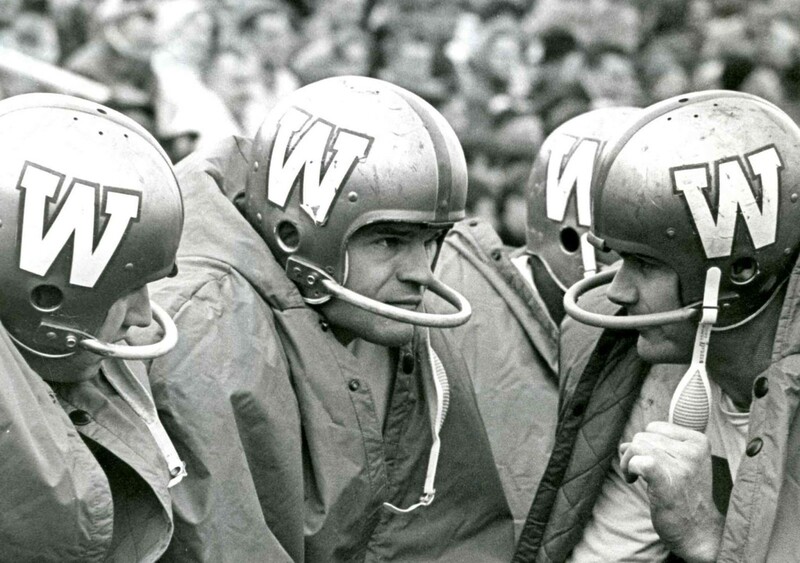 A dominant side again during the regular season – Winnipeg would post a league-best 11-5 record in ’62 – the Bombers were fortunate just to make it to one of the strangest Grey Cup games every played. The Calgary Stampeders had captured the first game of the best-of-three West Final and, after losing the second, were ahead with just one play remaining in the decisive game at Winnipeg Stadium. Gerry James had a 17-yard field-goal attempt partially blocked by Jim Furlong of the Stamps, with the ball bouncing into the Calgary end zone. Calgary’s Harvey Wylie opted to kick at the ball to get it out of play, but his attempt hit a charging Farrell Funston of the Bombers, who fell on it for a touchdown and a 12-7 Bomber win. 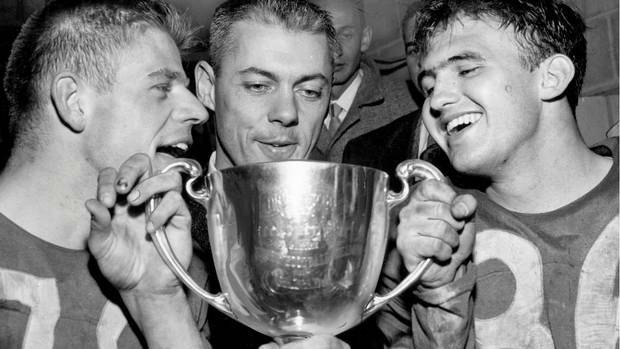 The 1962 Grey Cup – which became known as ‘The Fog Bowl’ — featured the Bombers meeting the Hamilton Tiger-Cats for the fifth time in six years and was carried live for the first time on a commercial U.S. TV networks (ABC). But as the fog rolled in off Lake Ontario for the late Saturday afternoon telecast the conditions worsened dramatically. That’s when CFL commissioner G. Sydney Halter opted to postpone the game with 9:29 remaining and the Bombers leading 28-27. The two clubs returned to Exhibition Stadium the next day – with just 15,000 fans returning – but there was no more scoring. Bombers running back Leo Lewis, who scored two touchdowns and threw for another to Charlie Shepard – who also scored two TDs – was named the game’s MVP. Blue Bombers (28) – TDs: Leo Lewis (2), Charlie Shepard (2); Converts: Gerry James (4). Tiger-Cats (27) – TDs: Garney Henley (2), Bobby Kuntz, Dave Viti; Convert: Don Sutherin (2); Single: Don Sutherin (1). The Bombers were stinging from a loss in the 1960 West Final when the ’61 season opened. Winnipeg had posted a league-best 14-2 record in 1960, a winning percentage that remains unmatched by any other Bomber side in club history. But in the three-game divisional final the Bombers beat the Edmonton Eskimos 22-16 and then fell 10-5 and 4-2 – the key play in the clinching-game a fumble by quarterback Ken Ploen. Ploen would more than redeem himself in 1961 after hammering the Calgary Stampeders 14-1 and 43-14 in the West Final. Not surprisingly, the Bombers – 13-3 that season – would meet the Hamilton Tiger-Cats for the Grey Cup. The Ticats were led by Bernie Faloney and held a 14-7 lead heading into the fourth quarter as the star quarterback connected with Paul Dekker for a 90-yard TD in the first and followed with a 23-yard scoring strike to Ralph Goldston in the third. But the Bombers, led by superb two-way lineman Frank Rigney, would limit the Tabbies to just 25 yards rushing. And while Ploen and Hal Ledyard would combine to complete only 12 of 22 passes the ground attack of Leo Lewis and Roger Hagberg were able to rumble for 268 yards. As the game wore on the Bombers grew stronger. 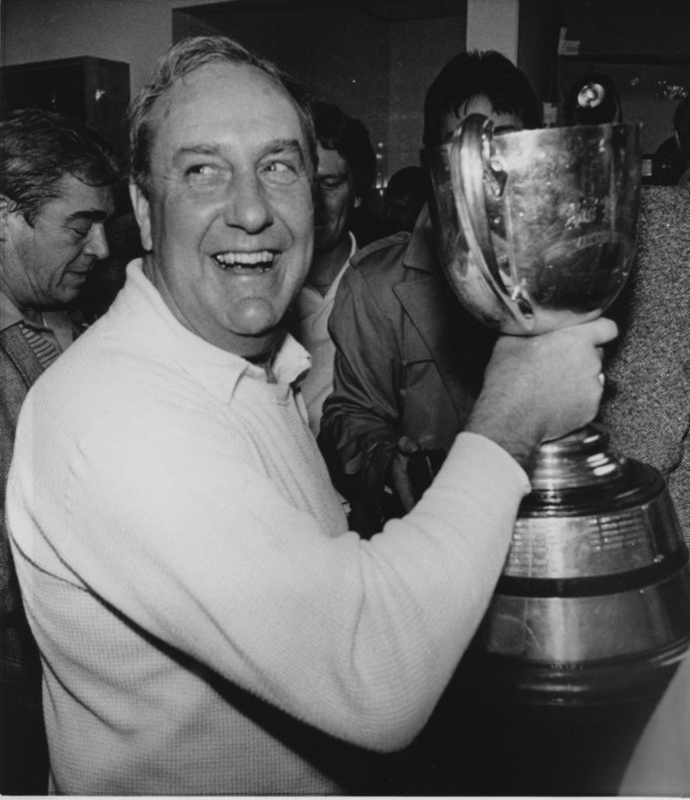 And when Gerry James slammed home from three yards out in the fourth quarter, the game was sent into extra time – the first Grey Cup to be decided in overtime. Ploen would play the hero in OT in one of those moments that will be forever etched in Bombers and CFL history in one of the greatest single plays in the league’s history. In the second overtime, Ploen dropped back to pass, but finding no one open opted to run. His 19-yard scramble to pay dirt – in which he eluded several would be Ticat defenders – is one of the most-spectacular runs football fans have ever seen and was part of an effort that made Ploen the game’s MVP. Tiger-Cats (14) – TDs: Paul Dekker, Ralph Goldson; Convert: Don Sutherin (2). Following another dominant regular season in which the Bombers finished with a 12-4 record, the club would knock off the Edmonton Eskimos en route to another Grey Cup showdown with the Hamilton Tiger-Cats. After years of playing the Grey Cup at Varsity Stadium, the 1959 championship was held at Exhibition Stadium, a new park on the Canadian National Exhibition fairgrounds right on the shores of Lake Ontario. But there were troubles with the change of venue. The field was covered with a tarpaulin the night before the game, but it did little to protect the turf. During the contest, groundskeepers were often seen scrambling onto the field during breaks in the action to replace giant chunks of sod which had become uprooted. Before the heroics of Ken Ploen in 1961, before the Tom Clements-to-Tony-Gabriel big finish for Ottawa in 1976 and Dave Ridgway’s dramatic kick for Saskatchewan in 1989, there was the 1958 classic – still to this day ranked as one of the greatest Grey Cups of all time. The Bombers and Hamilton Tiger-Cats met in a rematch of the 1957 title game, won easily by the Ticats 32-7, in a match=up that would become common over five of the next six Grey Cups. In 1958, the Bombers and Ticats would trade shots like heavyweight contenders in a prize fight. Hamilton jumped to a 14-0 lead early by capitalizing on Bomber miscues, including a fumble by Winnipeg rookie QB Jim Van Pelt that was returned 75 yards by Ticat defender Ralph Goldston. 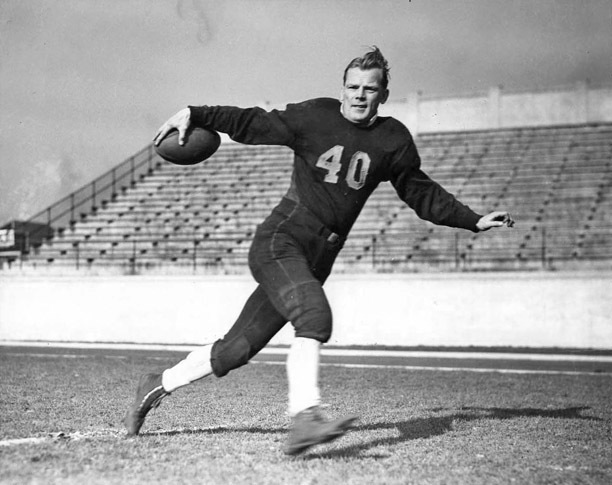 The Bombers other QB, Ken Ploen, had injured his shoulder in the sixth game of the regular season and had been replaced by Van Pelt. Ploen, showcasing his amazing athleticism, would still suit up for the Grey Cup and star in the secondary. Before the day was over Van Pelt and a number of other Bombers all took turns leading Winnipeg to victory to end a 17-year drought from the winner’s circle. Van Pelt scored on a sneak to get Winnipeg on the board and then kicked two field goals to cut the Ticat lead to 14-13. That’s when Hamilton head coach Jim Trimble – who had said before the game his team would ‘waffle’ the Bombers – made one of those coaching blunders that lives to this day. On the last play of the first half Trimble elected to punt with Hamilton scrimmaging from their own 13-yard line. Norm Rauhaus busted through the line to stuff the punt and recover it in the end zone to give the Bombers the lead. In the second half Leo Lewis connected with Van Pelt for a TD on a trick play as part of a day that saw the Bombers QB finish with 22 points – a Grey-Cup record that stood for 19 years until Montreal Alouettes kicker racked up 23 points in the 1977 Grey Cup. 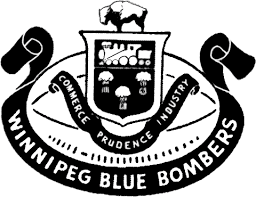 Of the four Grey Cups the Bombers would win over a five-year span from 1958-62, most of those involve savour the 1958 championship the most. 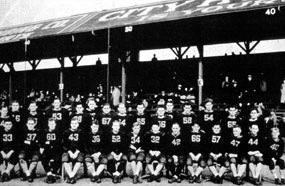 The Rough Riders were making their third consecutive appearance in the title game, while the Bombers arrived for their fifth Grey Cup in seven years dating back to 1935. The two squads served up a dandy final in a game played in perfect conditions – 15 degrees Celsius at kickoff. The Bombers opened the scoring on a 24-yard field goal by Ches McCance, with Ottawa taking the lead back when Tony Golab’s short punt bounced back to him before he scrambled 45 yards for a TD. The Bombers tied the score at 9-9 in the second quarter after some shrewd work by punter Wayne Sheley. Noticing the Rough Riders appeared to be lining up for a punt block, Sheley completed a pass to Bud Marquardt and raced downfield before lateralling to Mel Wilson for a play that covered 45 yards. Winnipeg took the lead early in the second half when Marquardt scooped up a fumble and rushed 44 yards for a TD and a 15-9 advantage. The Rough Riders countered with two field goals to tie the score at 15-15, but McCance hit on a 38-yard field goal while an Ottawa attempt from 17 yards out with less than four minutes remaining sailed wide to preserve an 18-16 win. Key to the victory was some considerable scouting work done by the Bombers. After the game, Bombers coach Reg Threlfall held up a five-cent notepad and two scratch pads with contained all of Ottawa’s plays. “This scribbler I’ve had for years,” Threlfall told reporters. “When we played Ottawa two years ago in the final I made diagrams of all their plays. This pad (holding up another) has diagrams of the Ottawa plays noted by (assistant coach) Bert Warwick when he scouted the Ottawa versus Hamilton Tigers game last week in Ottawa. The Bombers were dealing with the emotional hangovers from Grey Cup losses to the Toronto Argonauts in 1937 and 1938 when they advanced to the 1939 championship by winning a two-game total-point West final over the Calgary Bronks. 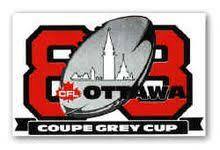 Ottawa, playing in front of a home crowd, was heavily favoured heading into the game having out-scored their opposition 207-51 in 12 games prior to the Grey Cup. Conditions were far from perfect and the field was rock hard. In an attempt to soften the turf, organizers poured 400 gallons of gasoline on the field and let it ablaze the day before the game. But freezing conditions overnight didn’t help those efforts. Ottawa opened the scoring, but the Bombers countered after recovering a fumble deep in Rough Rider territory, with Andy Bieber waltzing in for a seven-yard TD. The game’s scoring then came from singles on missed field goals. With the score tied 7-7 Jeff Nicklin recovered a fumbled punt for the Bombers at the Ottawa 34 to change field position. A subsequent Bombers punt into the end zone was kicked out by the Rough Riders, but shanked out of bounds only to their eight-yard line. And with 45 seconds remaining, Winnipeg’s Art Stevenson crushed a kick into the stands for a single and an 8-7 victory. Fritz Hanson, who played a critical role in the Bombers first Grey Cup win, was again superb in his punt returns and finishing with 126 yards rushing. The headline in The Winnipeg Free Press after the 1935 Grey Cup screamed: ‘Zowie! ‘Pegs Win’ and it captured the magnitude of the moment. 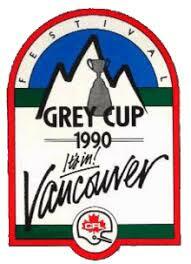 Not only did the victory mark the franchise’s first championship, it was the first Grey Cup title captured by a team from Western Canada and marked the first time a team had won with American players in its lineup. The Tigers had dominated their opponents in the East and were heavily-favoured heading into the game. The 1935 Grey Cup was the first to be broadcast nationally on radio and Winnipeg fans were no doubt thrilled when the ‘Pegs – yet to be named the Blue Bombers – opened the scoring on a Bob Fritz 23-yard touchdown pass to Bud Marquardt. Winnipeg would score again through the air, after Russ Rebholz took a lateral from Fritz and then connected with Greg Kabat for a 33-yard touchdown. Hamilton narrowed the Winnipeg lead to 12-10 when the star of the game – Fritz Hanson – would work some of his magic on a 78-yard punt return TD that proved to be the decisive score. Hanson, AKA the ‘Galloping Ghost’, ‘Twinkle Toes’ or the ‘Perham Flash’ (he hailed from Perham, Minnesota) would finish the day with an incredible 334 yards in punt returns.